Walking three mph, for six hours, each day is a lot of cardiovascular exercise and far exceeds the American College of Sports Medicine's recommended accumulation of more than 250 minutes of moderate physical activity to induce weight loss. Walking is a moderate- to low-impact exercise that is practical for most people to participate in and can be performed on a treadmill, sidewalk or walking trail. 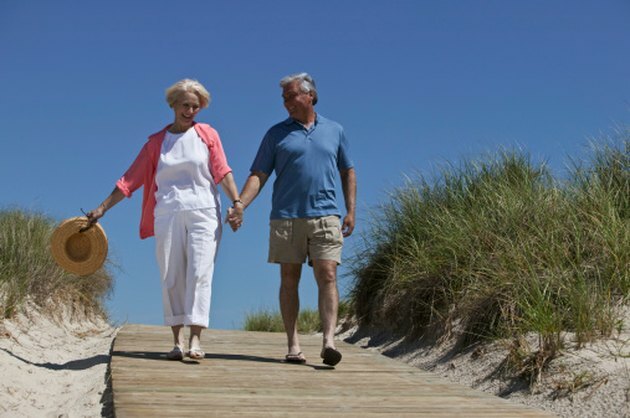 This makes walking one of the most accessible forms of cardiovascular exercise there is. The Department of Cambridge Community Development states that a 150-lb. person burns approximately 263 calories per hour of walking when going 3 mph. Inshape Indiana states that individuals weighing 125 lbs. can expect to burn 199 calories per hour. Heavier individuals who weigh 175 lbs. or 200 lbs. can expect to burn 278 or 318 calories, respectively. To figure out how many calories you burned each day you will need to multiply the rate at which you burned the calories by how many hours you performed the activity. For a 150-lb. individual that walks 3 mph for six hours he can expect to expend 265 calories per hour times six hours, which equals 1,590 calories expended during the walk. Since there are seven days in a week, and this same 150-lb. person walks every day, then multiply the calories burned per walking session by the number of days or 1,590 calories burned times seven days, which equals 11,130 calories. Performing this type of exercise regimen burns a lot of calories but what does this mean for weight loss. To determine how much weight loss this amount of exercise amounts to, you must first assume that your diet is balanced and you are eating enough calories to satisfy your energy needs throughout the day, not including the exercise. Your body's storage system for calories is in fat and each pound of fat in your body can store 3,500 calories. To determine how much weight loss you can expect in a week provided you follow this routine and weigh 150 lbs., simply take the total weekly calories burned and divide it by the number of calories in one pound of fat or 11,130 divided by 3,500 or about 3.2 lbs. of weight loss per week. If your weight falls between the weight classes you will need to estimate approximately how many calories are burned by choosing a value between the two. For instance, if you weighed 137 lbs. then your calories burned during a 3 mph walk would be between 199 and 263 calories, in this case, roughly 231 calories. Also note that as you lose weight, you will need to constantly adjust your calculations because the amount of body weight you are moving when you walk is decreasing. Can Walking for 5 Hours Make You Lose Weight? What Does Walking Work on Your Body?